Whether you are interested in scheduling repair or maintenance for your home appliances, our LA team is at your disposal. We provide excellent appliances service in Los Angeles, California. Each one of our company’s service vans contains all tools and replacement parts that might be needed for the job. 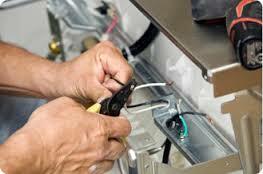 Our goal at Appliance Repair Service Los Angeles is to cover all needs promptly and properly. With the quality of our work and the commitment we bring to the job, your appliances are serviced to function well and last. Contact our techs for any appliance service in Los Angeles. Want to replace the seal of the oven’s door? Is there water inside the refrigerator? Need to routinely inspect and service your dryer and washer? It will be the pleasure of our team to cover such needs. Any kitchen appliance repair. We fix all major appliances but also microwaves and other small units. From the freezer and fridge to the oven, range, dishwasher, and stove, leave the service of any kitchen appliance to us. Laundry repairs. Need to repair washing machine problems? Having dryer issues? Leave both appliances and their services to us. We also provide combo appliance service. During repairs, our goal is to find the worn parts and any weakness that keep the appliance from working right. With the skills to troubleshoot, diagnose, and fix appliances, our appliance technician will fix yours in no time. On top of repairs, we also cover your Los Angeles appliances service needs on an annual basis. By maintaining home appliances, we make sure they run free of problems. With all their parts checked and fixed, they won’t waste energy or surprise you with emergency issues. For the best home appliance service in the LA area, get in touch with us. It’s our job to service appliances and we do our job well.